In his first visit to the Wayanad Lok Sabha constituency after April 4 when he came along with his sister Priyanka Gandhi to file his nomination, he earlier made a quick visit to the famed temple of Lord Vishnu at Thiruneli where he performed "beli tharpanam" in memory of his father, former Prime Minister Rajiv Gandhi. He took note of every detail told to him by the temple priests and then prayed to the deity. He, along with the priests, later walked some 700 metres to the spot where his father's ashes was immersed on May 30, 1991. "I stand here not as a politician, but as a son, brother and a friend. I decided to contest from here so as to project that south India is as important as other places. I seek a relation with Wayanad that will be there forever," said Gandhi to a huge round of applause at Sultan Battery. "I have come to know all the problems that you are facing here and I am not like Prime Minister Narendra Modi and will never give you a false promise. I wish to thank everyone here who gave me a chance to contest from here," he added. 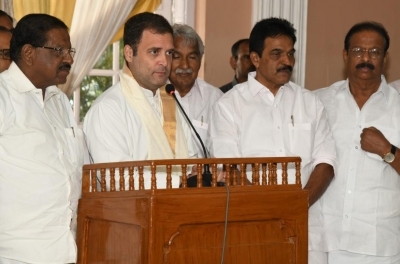 In Wayanad, from where he is contesting along with his traditional seat, Amethi in Uttar Pradesh, the Congress chief faces the Communist Party of India's P.P. Suneer, who is the candidate of the ruling Left Democratic Front and Bharath Dharma Jana Sena Chairperson Tushar Vellapally, who is the National Democratic Alliance candidate. While he won his first election by a margin of over 1.5 lakh votes - the state's highest margin of victory in 2009, in 2014, his majority fell to around 20,000 votes. Elections to Wayanad will be held along with the state's other 19 seats in the third phase of the Lok Sabha polls on April 23.